The tablet competition is as heated as ever. While Samsung is seemingly taking a break from the race by serving us with a less than competitive recent batch of tablets, we are eagerly looking around to see what the competition will have on offer in the second half of 2013. Amazon still hasn’t announced its bid but we are already seeing reports that the company’s next gen tablets will make use of some powerful hardware. According to a report, based entirely on industry sources and eye-witness accounts, the next generation of Kindles will include three devices in three different tiers. The highest tier – the Kindle Fire HD 8.9 – will sport the impressive 2560 x 1600 pixel resolution (up from 1920 x 1200 px) and a quad-core Snapdragon 800 chipset. Of course, the other two tablet tiers will each see a bump in specs. At the lowest end, a $159 price tag will get you a 7-inch tablet with a resolution of 1280 x 800 pixels (as opposed to the current 1024 x 600-pixel resolution of the vanilla Kindle Fire). 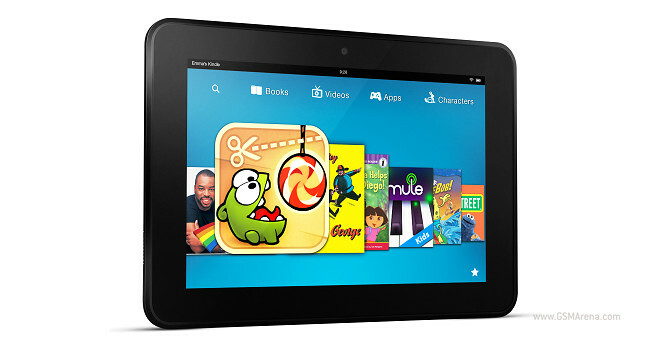 The current Kindle Fire HD is a 7-incher with a resolution of 1280 x 800 pixels. This one will be updated with a Full HD screen with 1920 x 1080 px resolution and will run on the top-of-the-line 2GHz quad-core Snapdragon 800 chipset. It will have 2GB RAM, four Krait cores and an Adreno 330 graphics. A front facing camera will be present, while 3G connectivity will be optional. There will be 16GB, 32GB or 64GB versions and, I am guessing, no microSD card. Current prototypes reportedly use Android 4.2.2 Jelly Bean with Amazon’s heavy customizations on top. The most high-end device of the trio – the Kindle Fire HD 8.9 – will use the same quad-core Snapdragon 800 chipset with 2GB RAM, but this one will also have a 8MP camera on the back. The new models follow an entirely new design language without any curves around the back and angles and with a more “chiseled” look. All tablets are said to be easier to handle and lighter than the current generation. The 7-inch Kindle Fire HD should weigh a tad less than 400 gr, while the 8.9-inch model should weigh around 550g. The 7-inch Kindle Fire HD will also reportedly has a slimmer bezel of around 1.20cm, while the 8.9-inch model will have a bezel of around 1.7cm. I can’t wait to hear more details about these tablets from Amazon itself. The sources for this story mention that the tablets are expected by the end of September, so we should probably see an announcement like last year’s – in the beginning of September (or why not even earlier).